The week's top Mac news: Apple began shipping 1.5 GHz Mac minis last week, but they're in boxes with exactly the same markings at 1.42 GHz models. Buyers have no way of knowing which speed they're buying until they open the box. "Apple Computer confirmed to eWEEK.com on Thursday that some Mac Minis currently being sold may indeed be faster and more powerful than labeled, with better processors and some improved peripheral features than is marked on the outside of the box. "The Mac Mini is Apple Computer Inc.'s low-end desktop computer; models range in price from $499 to $699." "Apple has confirmed that some Mac minis have shipped with a better-than-advertised spec. "However the company would not also confirm whether the reported specs - including 1.5 GHz processor, extra video RAM and Bluetooth 2.0 - are accurate." informit.com has published a chapter excerpted from David Coursey's new The Mac mini Guidebook. "This chapter is primarily for readers who have not yet purchased a Mac mini. Yes, there are only two models to choose from, but there are still a handful of choices to make about specific components you should buy. How to select the Mac mini that's right for you. The best place to buy a Mac mini. "In the next few pages, I describe the two Mac mini models and all the options available from Apple to help you decide what's best for your needs." "When Steve Jobs unveiled the first Macintosh computer in January 1984, the smiling Mac icon, designed by Susan Kare, that appeared as the system booted up was the first human face to be presented to the public by a personal computer. "Indeed, this was the singular vision for the Macintosh, to produce a personal computer that was both affordable and easy to use. Kare's work on the original icon set, font family and interface tools played a crucial role in the success of that project. "Kare has a background in fine art, and holds a PhD in the subject from New York University. In fact, when old school friend and software maestro Andy Hertzfeld first approached her to talk about the Macintosh project, Kare had only recently resigned from a curatorial position at San Francisco's Fine Arts Museum. "'The advantage of working in pixels is that it's iterative,' says Kare. 'You can consider one approach, try another and see how something looks with one dot off or on.' And that's just how it worked, one dot at a time on a 32 x 32 grid. "Each of the Macintosh icons was designed on the Mac while it was still being developed. Initially this required Kare to calculate the hexadecimal number of any pixel she wanted to change until Andy Hertzfeld produced an icon editor that enabled direct access to the pixels." "There's only been one standard in the PC industry that has survived and thrived over the past decade - Universal Serial Bus, good old USB. "Compare USB's evolution to the headaches over DVD standards, HD-DVD standards, and the whole wireless crowd. "One day books will be written on the Machiavellian posturing that continues to take place on trying to establish a 'standard' for 802.11n while Airgo Systems rolls out second-generation chipsets that will more than double the proposed 108 Mbps 'standard' speed this fall. "The first USB hardware implementations started shipping in 1996 and ended up fully blessed by Microsoft by 1998/Win98. Early implementations were slow at 12 Mbps and the device involved - not bad if you were plugging in keyboards and low-speed devices, but not speedy, either. "When USB 2.0 came out in 2001 it was in a head-to-head competition with the first-generation FireWire standard supported by Sony and Apple. USB ran at 480 Mbps, while IEEE-1394 ran at 100 to 400 Mbps. Of course, FireWire wasn't helped by Apple and Sony implementing slightly different versions, Apple's greed to collect licensing fees, and the expense to implement it in hardware." Mini Ture_MacJournal says: My Mac mini and iPod go down to the Southern edge of this Continent Australia a cold September of iRoaming interesting events. "The form of the iPod, iMac G5, and the Mac mini, in a way being so radically different from what has gone before has 'ipso facto', established a new generic form, a new archetype of form factor expectation and specificity, and so we now expect form factors to express radically new and emerging device technology in brilliant new economic design forms." Bus powered FireWire 800 (400 compatible) with a USB 2.0 port. FireWire 800-800 and 800-400 cables included. 7200 RPM 3.5" drives for high performance. Fast as any desktop drive. Power on LED. Access LED. Power switch. +12V DC in - When used, overrides bus power automatically. World compatible AC adapter - Accepts 100-240VAC. Compatible with most FireWire host ports that supply bus power. PR: Other World Computing (OWC) has updated its Neptune "Value Done Right" FireWire line for the second time in three months, this time adding a 400 GB 7200 RPM model and lowering prices on other models by as much as 8%. The drives ship with all FireWire cables, Intech HD SpeedTools and EMC/Dantz Retrospect Backup, and are supported by a one-year OWC warranty. Each one measures 1.5" x 9" x 5.5" and weighs less than three pounds. Don't let the small package fool you. These drives can handle all your audio/video, backup or general storage needs. "The market has been favorable for us and we went to pass along those savings to our customers," said Larry O'Connor. "We also strive to keep up with the needs of our customers which is why we're always adding more options to this and all our lines of drives." FireWire 800, FireWire 400 and USB 2.0 ports. Bus powered in FireWire mode with powered FireWire ports. Brushed & embossed aluminum case is tough and looks awesome. Tactile feel edges allow for a great grip. Includes FIVE different cables and adapters! Combo GB is bootable in FireWire mode on any Mac or properly equipped PC. Plug & Play without drivers on all recent operating systems. PR: FirmTek, LLC is again pushing the price/performance envelope with the introduction of their new external SeriTek/2eEN4 Serial ATA 4-bay enclosure. The SeriTek/2eEn4 features the latest eSATA technology and delivers four state-of-the-art hot swappable hard drive bays to support today's demanding media-rich applications. "We are raising the bar again with this storage solution by coupling the latest advances in Serial ATA technology with best-in-class features including new eSATA connectors, a whisper-quiet design, 3.0 Gbps transfer rate, exclusive Heat Management System, a true hot swappable backplane design with no internal cabling, and the smallest footprint," said Chi Kim Stanford, Vice President of Business Development. "We are following through on our continuing commitment of offering the best values and most solid products in the industry by providing the SeriTek/2eEN4 at an affordable price." The SeriTek/2eEN4's exclusive Heat Management System ensures hard drives are kept cool and reliable while keeping noise to a minimum. This is accomplished by utilizing whisper quiet fans and special warning indicators. In the unlikely event a fan fails or temperatures become too extreme, fan or temperature LEDs will light and a "mute-able" audible alert will warn the user. The SeriTek/2eEN4's sturdy anodized aluminum case gives it a look that's as professional as its advanced features. It is compatible with virtually every external Serial ATA host adapter on the market and supports data transfer rates of up to 300 MBytes/sec or 3.0 Gbits/sec per drive. It easily supports the most demanding applications like uncompressed high-definition digital video creation & editing, computer animation, and digital photography. 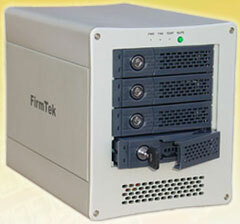 FirmTek's SeriTek/2eEN4 Serial ATA enclosure is available now for the estimated retail price of $499.95. PR: LaCie introduces an affordable and easy-to-use Hi-Speed USB 2.0 hard drive: LaCie Big Disk Hi-Speed USB 2.0 packing up to 1 TB into a sturdy aluminum d2 case. With USB connectivity and no software to configure, LaCie Big Disk Hi-Speed USB 2.0 is the ultimate combination of convenience, capacity and affordability per gigabyte. Drives ship standard with LaCie's new One Click Backup Software for PC and Mac. The Big Disk Hi-Speed USB 2.0's portability and versatility make it easy to use at any workstation. This low-cost alternative is ideal for backing up several workstations or handling space-hungry applications. No need to configure any software--just hook it up to a universal USB port on any PC or Mac and start swapping images, large files or office documents right away. "There isn't a drive on the market that can offer the affordability, design, versatility, convenience and performance of the LaCie Big Disk Hi-Speed USB 2.0," says Olivier Mirloup, LaCie Senior Product Manager. "This drive is the highest quality, easiest to use product in its price range." LaCie Big Disk Hi-Speed USB 2.0 is available end of October at the retail prices below via LaCie's specialized dealer network. Now accepting preorders. 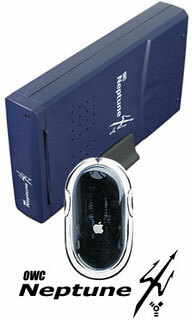 This product will ship in late October 2005. Big Disk Hi-Speed USB 2.0 comes with all necessary cables and includes a one-year limited warranty in the US and a two-year limited warranty in Europe.